This is our comprehensive top quality GAS IT Twin 6kg & 11kg Combo Refillable Gas bottle kit for Caravans or Motorhomes with Remote fill point system. We recommend you purchase 1 x GLS300 Gas leak detection spray - to test the installation for your peace of mind and safe, confirmed leak free pipe joins. This GAS IT brand of 11kg Refillable gas bottle is fitted with auto shut off 80% fill float level and a content controlled level indicator on bottle outlet valve. Bottle comes with the standard refillable inlet elbow with JIC fitting identical to our other bottles and Gaslow, Caratank etc. These Refillable gas bottles can be partnered up with the identical Gaslow type so you are sure of absolute compatibility should you decide to have more than one bottle fitted. 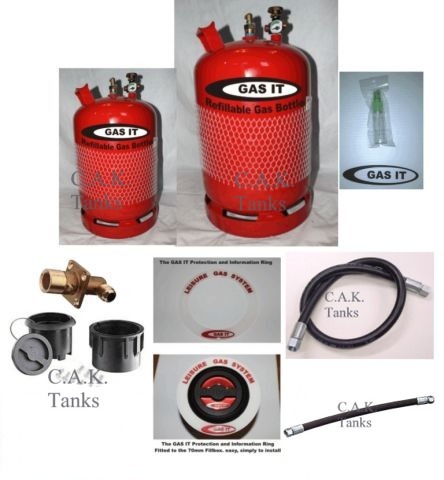 This bottle also works with the Gaslow, Caratank and GAS IT fillpoints, hoses, fittings etc.